Container gardens are perfect for small spaces, and for adding dimension to any landscaped space. On June 18, at 7pm, Master Gardener Judith Peacock will be sharing secrets for eye-catching compositions in her presentation “The Artful Container Garden”. Judy’s lifelong love of nature and her natural creativity blend themselves abundantly in beautiful container gardens. Her designs can be surprising and are often whimsical, with many everyday items incorporated in unexpected and inspiring ways. She credits her passion for gardening to her mother, who Peacock says encouraged her throughout childhood to learn the names of trees and plants, and to make small flower arrangements – Judy’s favorites were made with violets and daffodils. 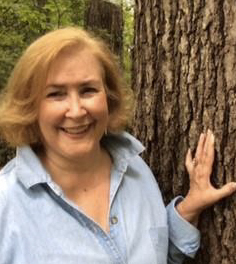 Later, as a young bride living in a local Sandy Springs cottage that was surrounded by 40 acres of woodlands, Judy learned to identify wildflowers and began to take care of the plants that were part of the old garden on the property. Falling back on her degree in Art Education, Judy made arrangements for friends’ weddings, and work and church events, often using her favorite wildflowers and “found” items to help save money. During her presentation, this North Fulton Master Gardener will complete containers to be given away at the end of the evening. Winning one of Judy Peacock’s creations will be exciting; however, everyone will leave with a better idea of how to create individual works of art that grow and delight all season.